Sarah Sitkin is one of my favorite visual artists and am privileged enough to call her a friend. You may have seen her work for John Frusciante, Venetian Snares, Otto von Schirach, Captain Ahab and most recently SONOIO. Despite the playfulness and vivid colors, I always saw a darker side to her work and wanted to exploit it. I sent her the album, it’s lyrics and minimal direction – she went to work and produced some of the most breathtaking work I’ve seen. I suppose this is the official announcement of a new album to be released in September under an undisclosed label. It’s title is To No Avail and is planned for digital and vinyl release. 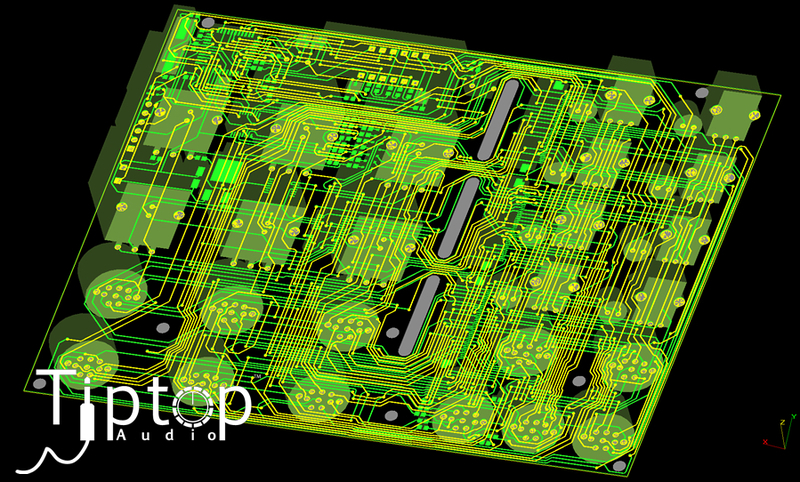 Here we go, first polyphonic module to go to pcb prototype! – Gur of Tip Top Audio introducing his first polyphonic design on Muffwiggler. WE ARE COMING TO DESTROY YOU. Full details here! The closest thing to you being a part of our world: a world filled with horrifying NSFW links (Surachai), constant audio news (Richard), spamming (Justin), living as a musician (Alessandro) and insults (all of us). Follow us! This is Richard getting back into his system after being on tour in Europe and taking a break from work… Enjoy! VaporWave-Acid Jam from Richard Devine on Vimeo. Late night abstract acid modular jam using the MakeNoise rene, brains, and 4 pressure points. Everything clocked to 1 plan-B mini ELF lfo. Trying to make squelchy acid basslines with the WMD Gamma Wave Source – Dual WaveTable VCO. Alessandro’s SONOIO project has just announced a tour with Ladytron across the US this fall. Details HERE. Aside from that little bit of news, welcome Alessandro to T_A! Alessandro Cortini’s experience spans from working in the studio and on the road with several notable bands like Nine Inch Nails, Muse, ModWheelMood, Sonoio, Ladytron and many others. He also served on the staff of Musician’s Institute in LA and guest lectures at Berklee School of Music in Boston. He is highly regarded and sought after for his unique approach and experience with synthesizers, specifically his mastery over the arcane Buchla system. Trash_Audio is honored to have him part of the crew. His contributions to Trash_Audio in the past couple years has been uncredited but now you’ll know where all the cat links originate from. Tom Erbe’s Pvoc kit was introduced today. I’ve been using Soundhack’s freeware plugins for years and think it might be time to throw down on this kit that includes time pitch & phase: stretching, shifting and smearing. This bundle includes presets made by Richard Devine. Download the demo and grab it for $99.